– President John F. Kennedy, 6 June 1963, on board USS Kitty Hawk. As America begins its drawdown in Afghanistan and embarks upon the Asia- Pacific rebalance, the U.S. Navy urgently needs to assess its approach to Integrated Air and Missile Defense (IAMD) and integrate emerging IAMD capabilities that will enable the fleet to successfully contend with our new reality. This discussion addresses the high and unforgiving end of the operational spectrum and calls for renewed emphasis on innovation and proficiency in IAMD. Substantial enhancements in the operational concepts and offensive warfighting capabilities of near peer competitors significantly shift the operational environment. In light of emerging capabilities and in order to maintain combat advantage, especially in the areas of tactical thought and doctrine development, we will accrue great benefits with a re-immersion into the art and science of IAMD. The operational environment and technology that drove the need for innovation and proficiency in air warfare during the Cold War belong to a fleeting past only a few active duty Sailors can recall. Yet, the emerging challenges we face today mirror those faced not only a generation ago, when advances in warfighting technology demanded both technical and tactical innovation. Once again, we must master sophisticated threats and tactics in the aerospace domain. The blue-water operational environment of the Cold War, relatively uncluttered by land mass reflections, dense commercial air traffic, and threats from non-state actors, envisioned a battle thick with hostile aircraft, surface combatants, and submarines launching saturation cruise missile attacks. Especially in the 1980s, AW tactics evolved rapidly to keep pace with advances in both air threats and fleet air defense capabilities. A well-organized spectrum of training, from classrooms ashore to advanced fleet exercises with allies, maintained tactical proficiency and often included proficiency firings of all AAW capable weapon systems. While generally confined to the carrier battle group, some excursions ventured into multi-battle group combined operations. Manual tactics, techniques and procedures (TTP) perfected by frequent drill and regular live fire exercises achieved high degrees of proficiency and integration. A syndicate of naval officers renowned for their expertise in air defense came of age with the proliferation of ‘G’ (guided missile) ships and reached the pinnacle of their influence in the early days of the AEGIS program. Commanding a cruiser designated as the Battle Group ‘Alpha Whiskey’ marked the brass ring of a Surface Warfare career. The demise of the Soviet Union began a period without a credible naval competitor and the following thirteen years of fleet operations primarily focused on support for strike, counter-insurgency and anti-terrorism. The Fleet’s warfighting emphasis migrated from the primary sea-control missions of the Cold War to contemporary operations in the littorals and resulted in a drift away from a fleet-wide emphasis on air defense. Anti-piracy, maritime interdiction, strike, and other operations in support of land operations prevailed. Absent pressing credible threats, few ships distinguished themselves in this particular warfare area. With our focus elsewhere, technology enabled the development of increasingly sophisticated threats and countermeasures. Today’s cruise missile threats are stealthy, extremely fast, and can be employed at great ranges, using multiple independent seekers and dramatic terminal maneuvers. The full range of ballistic missiles display similar capabilities, in addition to being longer range, widely dispersed, and capable of carrying weapons of mass destruction. Mobile launchers that quickly relocate and change launch axis, and theater ballistic missiles that dispense decoys and obscurants allow more capable adversaries to present daunting threats. In essence, ballistic missiles have become an asymmetric air force. Finally, small, slow and numerous reconnaissance unmanned aerial vehicles, intrusive cyber capabilities, and space based surveillance now threaten presumed net-centric advantages. We seldom contemplate the major or total loss of supporting information networks. In most A2AD scenarios, these threats will impede the freedom of access and action of commercial shipping, naval forces, and defended assets ashore and hold them at risk of damage. In response, we have fielded an impressive array of material solutions. The AEGIS Weapon System remains the world’s preeminent air defense system and is evolving to include advanced IAMD capabilities. Today our navy has thirty cruisers and destroyers capable of conducting Ballistic Missile Defense with additional ships undergoing installation and certification. Additionally, if properly employed with the right tactics, Navy Integrated Fire Control-Counter Air (NIFC-CA), the next variant of the Standard Missile family (SM-6), the E-2D with Cooperative Engagement Capability and 5th generation F-35 fighter aircraft will be IAMD game changers. The emergence of these quantum leap capabilities compels us to re-evaluate how we train, maintain, command, control, and employ these forces. Efficient and effective command and control (C2) of IAMD forces ensures that we employ these new capabilities to their maximum effectiveness, which requires moving beyond the C2 approach under which we currently operate. Fighting multiple engagements in today’s fight is likely. We will achieve success by developing innovative C2 based on rigorous experimentation by the Aviation and Surface Warfare communities using both high fidelity simulation and fleet wargames. The initial NIFC-CA CONOPS is currently under stakeholder review and will require testing and refinement as we deliver the tactics, techniques and procedures needed to exploit our new IAMD capabilities. In this process, we need to apply the focus, rigor, and innovation, which enabled us to master AAW in the 1980s. The complexity of this mission boggles the mind, spanning the warfighting spectrum from strategic defense against intercontinental ballistic missiles to defeating small, slow, drones with nothing more than a camera and a radio transmitter as their main battery. We already possess formidable IAMD capabilities and even more potent ones are on the way. In order to exploit these systems, there must be a relevant operational vision, a concept of operations, and updated tactics, techniques and procedures and a cadre of experts who understand the employment of joint and combined IAMD capabilities against current and emerging threats. All of these begin with the operational idea of gaining and maintaining air superiority in the vicinity of defended assets at sea and ashore. The inherent mobility, persistence and responsiveness of naval forces to conduct IAMD have never been more relevant. More than ever, naval officers must think in terms of surface forces as the nucleus of IAMD forces in both developing and mature Theaters. They must also view naval IAMD in the context of joint and combined operations. The effort required to formulate the tactics to employ emerging capabilities is already underway in a series of wargames sponsored by Commander, U.S. Fleet Forces Command. Operationally experienced SWOs and aviators are collaborating to develop innovative tactics for these advanced weapons systems. We require pioneering naval officers to master 21st century warfighting technology, discard outdated ideas, and generate, sometimes from scratch, the tactics, techniques and procedures essential for effective employment of new weapons systems. A philosophy of mission command lies at the heart of this innovation. Mission command’s three elements of trust, understanding and commander’s intent are perfectly suited to high end IAMD. The principle understanding demands not only the “I know my wingman so well, I know what he will do next” but also, “I know this system of systems so well, I know what it will not do next.” Highly structured and static command and control fails to optimize the new systems’ agility and full design potential. Air Warfare has for the past 20 years been a highly scripted undertaking, yet, the modern IAMD operational environment is ill-suited to scripted solutions, and the nature of the IAMD mission demands trust in and understanding of the capabilities of the other participants in the IAMD Fight. This will come as the result of an increased emphasis on experimentation, wargaming and integration. Because complex new IAMD systems rely on precise technical and operational integration and a high degree of proficiency and teamwork, it is becoming increasingly apparent that we must dedicate periods of integrated IAMD training as a crucial part of deployment work-ups. Commanders, strike leaders, pilots, TAO’s and crews from ships and air wings outfitted with these new IAMD systems must fully integrate. Over the last 15 years, the lack of a pressing air threat and the reduction of commands dedicated to doctrine hindered the normal doctrine update cycle. During this same period, the advent of ballistic missile defense, the rapid deployments of U.S. and adversary capabilities, and the introduction of IAMD as an operational concept, rendered much of the existing doctrine obsolete. While the Navy Air and Missile Defense Command (NAMDC) and the Surface Tactics Development Group have taken steps toward improving the situation, the Navy is at a disadvantage in trying to formally articulate its IAMD equities in joint and combined arenas. This sophistication of IAMD in this new age and the revolutionary capabilities described in the next section demand updated doctrine. In a significant and profound step, the Surface Warfare community launched a commitment to develop expertise in IAMD. NAMDC established a 19-week course that will deliver subject matter experts to the Fleet. The IAMD Weapons Tactics Instructor (WTI) course focuses on the advanced IAMD training for individuals with the goal of improving unit level and strike group proficiency in IAMD. Candidates will be challenged, as they become experts in the latest capabilities, TTP’s, training strategies and threats. As the IAMD WTIs begin to reach the Fleet, their influence will extend well beyond the lifelines and impact both Fleet and Joint Operations. Our Center for Surface Combat Systems and Afloat Training Groups developed Advanced Warfare Training (AWT) for all AEGIS ships. AWT consists of multi-week classroom and hands on system training with individual watchstander and team training in a scenario environment. This is a critical step in AEGIS baseline training, ensuring shipboard competency and improved performance executing the IAMD mission. The AEGIS Weapons System (AWS) remains the finest and most advanced IAMD system ever put to sea. In 2011, the Navy initiated AEGIS Wholeness, a no-holds-barred approach to improving AEGIS Readiness. Many facets comprised this effort: Interoperability, Technical Support, Logistics, Type Commander sponsored SPY radar maintenance program, replacement of high failure SPY parts, and a revival of the SM-2 Fleet Firing Program. Impressive gains realized over the past two years include, increasing operational availability of deployed ships to over 96%. There is simply no substitute for continuous attention to the details of AWS material readiness. The effectiveness of the AWS strongly depends on how conscientious Captains and crews are about its material readiness. Over the past decade, Navy Ballistic Missile Defense grew from a pioneering vision to a National Defense mission. Given the proliferation of ballistic missile described above, BMD garners the highest priority maritime missions of Combatant Commanders and as a result, AEGIS BMD ships have the highest optempo in the fleet. 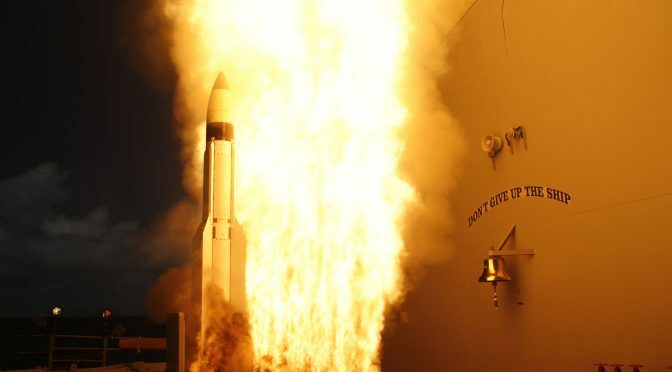 BMD is an inherently joint mission and AEGIS BMD ships (and soon, AEGIS Ashore) frequently integrate into the Ballistic Missile Defense System, a globally distributed and highly integrated combat system with elements from all the services and Functional and Geographic Combatant Commanders. As complex as BMD technology already is, radar and missiles continue to grow in sophistication. Mastery of the BMD mission requires sequential assignments at sea and ashore. Additionally, BMD Specialty Career Path officers are a start, but we must increase our cadre of BMD experienced Sailors at sea. Our newest AEGIS Baseline 9 represents our first true IAMD AEGIS Combat System computer program. Unlike previous BMD computer programs which had either AAW or BMD, both functionalities in Baseline 9 now reside in a single Combat Systems computer program. This combat system program is being tested in USS JOHN PAUL JONES (DDG 53). One of the key features of this baseline is the Multi-Mission Signal Processor (MMSP), which allows operators to dynamically allocate radar resources in response to specific threats. The most notable feature of Baseline 9 is the ability to conduct “integrated fires.” Integrated fires can occur between ships and between aircraft, but the most complex variant is NIFC-CA. NIFC-CA employs ships and aircraft to consummate missile engagements beyond the radar horizon. This execution is operational rocket science. Those who master it will be identified as the best and brightest. The U.S. Navy is developing and putting to sea revolutionary IAMD capabilities with the potential to be credible deterrents to war and if necessary, decisive factors in battle. However, in order to exploit these incredible advantages, Surface Warriors must embrace the art and science of IAMD. As sophisticated as they may be, these sophisticated weapons will require the sharpest operational minds using the best new tactics flowing from the crucibles of experimentation in stressing virtual warfare simulation and realistic fleet exercises. Developing a career long vocation as an IAMD expert must not be viewed as professionally stifling. Like other specialties, the IAMD mission is so incredibly broad, deep and complex, that it takes a significant amount of education, training, and experience for any officer to master. This is a professional commitment to which young officers must commit and senior officers must foster. The Weapons Tactics Instructor program initiated by NAMDC is a step in the right direction. While individual training provided ashore and within the lifelines Advanced Warfare Training are first important steps, we must redesign and revitalize our IAMD training for the Air and Missile Defense Commander (AMDC) and supporting elements within the Strike Group. This includes building block courses prior to the Warfare Commander’s Conference for the IAMD team. Putting NIFC-CA, SM-6, AEGIS Baseline 9, CEC, E-2D and F-35 to sea demands that we assemble Strike Group Staffs, ship crews and Air Wing personnel for significant, dedicated planning and integration periods to develop the mutual trust and the deep understanding of system capabilities and commander’s intent essential to successful operations. These efforts, though significant, are not enough. We must start to live and breathe Integrated Air and Missile Defense. IAMD must become the first, the last and the many in between thoughts of the Surface Warrior’s professional day. CAPT Jim Kilby is the Deputy for Ballistic Missile Defense, AEGIS Combat Systems and Destroyers in the Surface Warfare Directorate (N96). He commanded USS RUSSELL (DDG 59) and USS MONTEREY (CG 61). In MONTEREY, he deployed as the first ship to support the European Phased Adaptive Approach for Ballistic Missile Defense.